A Costa Rica judges guild is denouncing an investigation into the actions of three of its colleagues who presided at the original trial over the murder of sea turtle conservationist Jairo Mora. The guild says the nature and timing of the investigation, which comes during a second trial over the highly publicized 2013 Mora killing and the kidnapping and sexual assault of four foreign volunteers, could put undue pressure on the current trial’s judges to convict the seven suspects on trial. The same suspects were acquitted in January 2015 by the panel of judges under investigation. ACOJUD made the investigation into its colleagues’ actions public last week. The group filed an official complaint over the investigation, which was launched by the independent watchdog arm of the judiciary, called the Judicial Inspection Tribunal. The tribunal can take disciplinary action against any judicial employee for derelict of duty or ethical violation. The investigation can last up to a year, and depending on its outcome the judges — Hernán Salazar, Yolanda Alvarado and Luis Rodríguez — could face punishments ranging from a written warning to dismissal. The judges guild says investigating judges’ legal reasoning for deciding a case oversteps the tribunal’s role, and could influence judges to decide a case in a certain way. 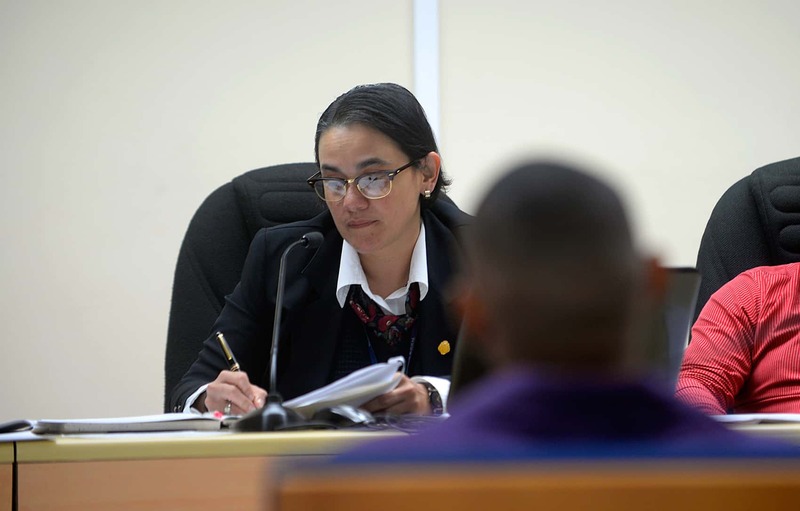 In this specific case, where a new trial is still underway, Orocú says it could pressure the current judges to rule differently in order to avoid being investigated themselves. Mora’s murder on the Caribbean Moín Beach on May 30, 2013 drew major national and international media attention, and demands for swift justice, including from the United Nations. Police arrested the seven suspects — Héctor Cash, José Bryan Quesada, Ernesto Centeno, Felipe Arauz, William Delgado and brothers Donald and Darwin Salmón — two months after the murder and spent more than a year developing the case for trial. All suspects were acquitted in the 2014-2015 trial now under investigation. During that trial, judges ruled that telephone recordings, transcripts of text messages and a telephone geolocation investigation were inadmissible in court because police and prosecutors mismanaged the evidence. Prosecutors said the evidence was crucial to their case. Following the verdict, the prosecution appealed and won a new trial on the grounds that the evidence was wrongly excluded from the first trial. Under Costa Rican law, prosecutors are allowed to appeal a case one time, making this trial the last chance for convicting the defendants. According to ACOJUD, the appellate court’s decision to hold a new trial should have been sufficient admonishment of the original judges’ decision to exclude the evidence. Orocú declined to comment on the possible reasons for pressure in this case, but noted that judges have been subject to similar investigations in other cases where there was significant media attention and political pressure to resolve the case a certain way. The second trial of the Mora murder suspects, being held in the Caribbean city of Limón, is expected to conclude before the end of March.